1. It clearly is an overdevelopment for 2,650 sq metres. 2. Only has two visitor parking spaces, therefore extra visitors will park on Kathryn Road, against a single white line which is illegal. 3. Has only a 7.1 metre setback. 4. Is out of character with single storey developments on either side of 13/15 Kathryn Road. 5. No on-site provision for rubbish bin collection. 6. Has no where for trucks to park during development, creating traffic congestion on a dangerous hill on Kathryn Road. The closing date for objections is 1st July 2012, next Sunday, which means Monday 2nd July will suffice. Ten objections are required to get a planning meeting with the developers. I think we may have a fight on our hands again. No 52 Kathryn must be preserved as a site of local significance. This is probably the only remnant bushland set amongst residential houses in Knoxfield, No 52 also has been designated as a "Site of Biological Significance" by the City of Knox and the advert has no notice of this fact, but advertises it as a site suitable for development. You can find the Knox web page devoted to this site at the above web page. No 48 Kathryn Road is also advertised for sale too. The scenario we presented to VCAT when we attended to fight numbers 40 and 44 Kathryn Road is now presenting itself. That is six acre blocks with 10 to 12 apartments on each. We already have four of those blocks either built on or pending. This is the massacre of Knoxfield we feared. At all costs we must save No 52 Kathryn Road from the developers. What a wonderful idea it would be if the City of Knox, the State Government and Knox Environment Society could work out a scheme to preserve this site of remnant bushland. It is not only Knoxfield residents that are concerned with planning. Read the article below for an explanation. A walk down Kathryn Road makes one wonder whether we live in the inner or outer suburbs. Look at the gardens in these latest developments, an absolute disgrace to residents that have pride in their suburb. Whatever happened to those magnificent gardens that were presented and articulated in VCAT? Whatever happened to the advanced canopy trees that were to be planted? Most have simply died as they were planted in water logged clay. This is just as we expected, without constant supervision from Knox City Council the developers get away with the cheapest option. Here’s the article from the Melbourne Leader. THE threat of skyscrapers destroying the character of their neighbourhoods causes Melbourne Leader readers to lose sleep at night. A Leader survey has found residents in the Melbourne and Yarra municipalities are the most prone to worrying about planning and development matters. Respondents were asked to rate their concerns across a number of issues, ranging between zero (not at all concernced) and 10 (extremely concerned). Local readers' mean score on planning matters was 7, compared with 6.3 across the metropolitan area. Former lord mayor Kevin Chamberlin, now chairman of the North and West Melbourne Association, said he wasn't surprised by the results. "I think it's a very informed response. It's clear that planning was out of control under (former Planning Minister) Justin Madden and the Labor Party, and it has resulted in a lot of inappropriate developments being approved," Mr Chamberlin said. Melbourne and Yarra residents were also more concerned than average about crowding on public transport (mean score of 7.8), climate change (7.6) and urban density (6.2). But Melbourne and Yarra readers were less concerned about urban sprawl (5.8), access to the city (4.4), access to schools (3.5), water shortage (6.9) and petrol prices (5.5). The results were from Leader's 2010 Cash for Comment. Readers told us what matters to them, what makes them happy and what bothers them. Some lucky readers shared in the $10,000 cash prizes offered by Leader. Some great VCAT news for Knoxfield. At last we’ve had a win. The McDonald’s review against Knox City Council’s decision not to approve the restaurant on Ferntree Gully Road, Knoxfield was won by the council and residents. The main reasoning was that it was considered to be an inappropriate activity in a Residential 3 Zone and residents’ concerns with traffic management. This is a wonderful result for the power of the little people and excellent representation by Knox City Council at VCAT. So after eight visits to VCAT we have had a win and I must say the most important win as a McDonald’s restaurant would have had a major detrimental impact on Knoxfield. What a pity some of the other VCAT visits did not have the same result! Congratulations to the eight objectors that ventured to VCAT for the McDonald’s Restaurant proposal and presented their arguments. A good hearing was conducted by the chair enabling a well-balanced argument against the restaurant to be heard. Objections centred on disruption to the neighbors’ lifestyle, traffic problems created by the proposal, lack of parking space within the restaurant, security in the vicinity, increased traffic, litter and smells for Kathryn Road residents and the undesirable effect on the Knoxfield Shopping Centre. VicRoads also presented an argument against the traffic flow proposal presented by McDonalds, forcing McDonalds to present two scenarios. Option A had traffic entering and leaving the restaurant in both Ferntree Gully and Kathryn Roads and Option B with entry only from Ferntree Gully Road and an entry and exit in Kathryn Road. Option B was VicRoads desired plan, which creates numerous problems for management of the restaurant with three entry points and only one exit point for all traffic including delivery vans. At the conclusion to the hearing, the chair announced that as VicRoads control Ferntree Gully Road option B is the only option he can consider. McDonalds do not want Option B, so they announced that it looks like we’ll all have to return to VCAT in the future. With some luck or good fortune we can hope that McDonalds will see the problems their proposal creates and withdraw their plan for a restaurant at the corner of Kathryn and Ferntree Gully Roads. Congratulations must go to Kerry for his research into the parking for this and nearby McDonalds’ stores. His close questioning of expert witnesses also added much input to the residents case against. Thanks also to Peter, Rafaele, Nick and Ian for their presentations. We now await the decision of the VCAT. 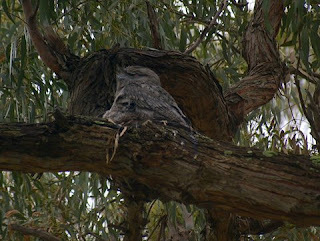 Today I took this photo of a Tawny Frogmouth and her young one in a tree in Kathryn Road, Knoxfield. The Tawny Frogmouth feeds on rodents, small possums and large insects. You may hear them banging their prey on your spouts at night while they kill them. With the continual building of townhouse units in Kathryn Road and depriving the wildlife of their habitat, what is to become of special visitors like these to our gardens. When was the last time you saw an Eastern Spinebill honeyeater in your garden. In the past they were frequent visitors to our gardens. Try planting some native plants like Correas and Epacris (heath) in your garden may encourage them to come back. Knoxfield is rich in wildlife, it’s a shame that we are continually depriving them of a home just to over-populate our suburb.